Sunday, Women Drying Their HairWaiter! Pène du Bois was a member of the Association of American Painters and Sculptors and worked hard to publicize the Armory Show. He also loaned a group of six oil paintings, including Interior, which were generally well received by the critics. The writer for the New-York Tribune opined: “There is no necessity of warning Mr. Guy Pene Du Bois [sic] against the manikin. 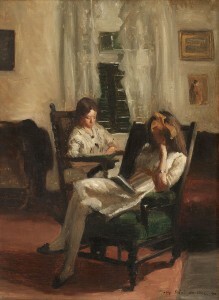 His little studies of New York types, full of technical promise, also show that he has the root of the matter in him and is feeling his way toward the very essence of character.” 3 Pène du Bois offered Interior for sale at the Armory Show for three hundred dollars, but it did not sell. 1920 United States Federal Census, available on-line at ancestry.com. In the past the painting has been referred to as Virginia III and Interior, Virginia and Jeanette. The identity of Jeanette is unclear. Reproduced in Betsy Fahlman, Guy Pène du Bois: Painter of Modern Life (New York: James Graham and Son, 2004), 82. “American Work in the Independent Salon,” New-York Tribune, March 2, 1913, 6.